City's 2011/12 annual report and accounts contains the usual mix of giddy blueness (apparently more people choose to be City than United when playing EA Sports FIFA 2012 - wow), photos of blue Santas and lashings and lashings of red ink. For a club like Manchester City of course, losses don't really matter whilst the owners are prepared to carry on writing cheques. In the last four financial years, the club has made pre-tax losses of £510.9m, all of which have been funded (through equity) by Abu Dhabi United Group Investment & Development Limited. What is interesting in the City figures is how the club is getting on with meeting the new UEFA Financial Fair Play ("FFP") regulations and how this will change the way the club is run. The first FFP hurdle is the 2013-14 "monitoring period" which looks at profits/losses (on UEFA's definition) in the prior two seasons (2011/12 and 2012/13). Over these years, losses should not exceed €45m (c. £36.5m at today's exchange rate). So how are City doing? 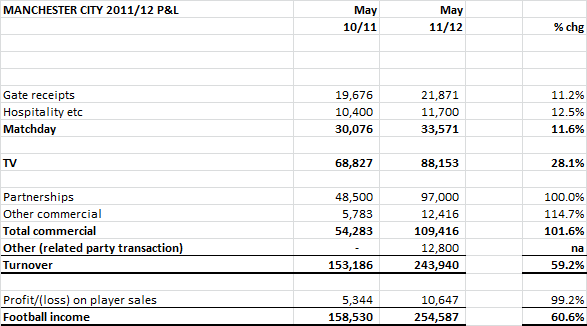 A quick glance at the profit and loss account suggests a long way to go, with a pre-tax loss of £97.9m. 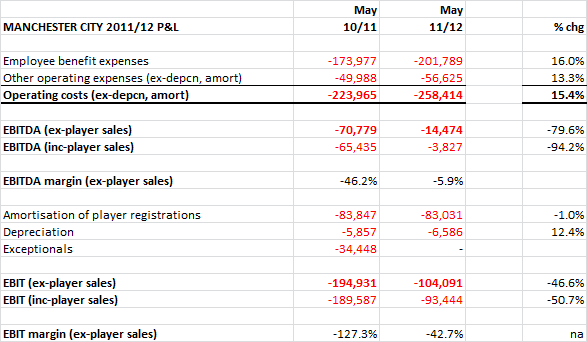 This is however a massive improvement on the £197.5m loss in 2010/11 (albeit this included £35m of "exceptional" costs). The huge reduction in losses is driven by a 59% increase in income at the club. In the table below I have changed the way the club present Commercial income to bring it into line with most other clubs by including hospitality income in "Matchday". The increase in Matchday was driven by higher average attendances (league gates averaged 47,031 vs 45,885 in 2010/11), one extra cup game and higher cup attendances from being in the Champions League. The growth in TV income reflects the impact of the club's short lived Champions League campaign which added £18m in extra UEFA TV money. The eye-catching growth comes of course from Commercial revenue and in particular "partnerships". Commercial income rose 102% to £109.4m in 2011/12 with 89% of this coming from the club's commercial partners. To put these numbers into context, United's total Commercial income in 2011/12 was only £8m higher than City's and (whilst definitions vary slightly) it looks to me that City's non-kit partner revenue was higher than United's. I will leave it to readers to decide for themselves whether City would have managed to get to almost £100m of partnership revenues if they hadn't been owned by a member of the Abu Dhabi royal family. Perhaps Etihad, TCA Abu Dhabi, aabar and Etisalat would have all signed up as City's sponsors if Thaksin Shinawatra or even Franny Lee was the owner..... Such debates are pretty superfluous, other clubs have established the benchmark for commercial income at £100m or more per annum and a legally well advised MCFC will no doubt meet that benchmark as long as the club is owned by ADUG. Whilst City's income rose 60% last season, cost control was actually quite good. Total staff expenses rose 16% to an English record £202m (by comparison Arsenal spent £143m and United £162m) but there were obviously significant bonus payments for winning the league meaning underlying growth in the wage bill was probably no more than 5-7%. 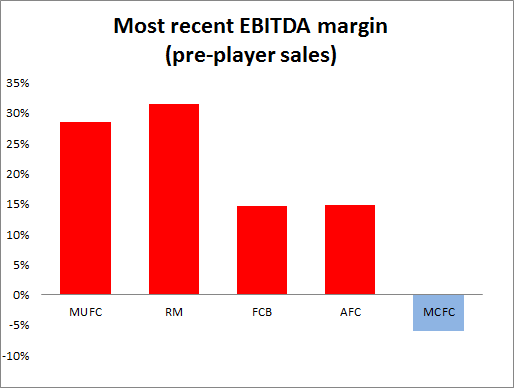 The key profit measure of EBITDA (essentially cash profits/losses before investment) was greatly improved with the loss before player sales down to £14.5m (a negative margin of 5.9%). This profit performance is still a long way off that of the major clubs with sustainable models (see chart below), but for the first time since the ADUG takeover, City are only making a small operating loss before investment spending. Below the EBITDA line comes the cost of transfer spending - the amortisation charge. Whilst net cash transfer spending in the season fell to £95.2m from £143.4m, the amortisation charge only fell 1% to £83.0m. Amortisation lags transfer spending and only reflects purchases not sales. To make a major dent in the amortisation charge (which is included in the FFP calculation), the club will have to rely far more on home grown talent than currently is the case. It is a key characteristic of the FFP rules that spending on youth development is not included in the profit/loss calculation whilst transfer spending is. Across in M16, United's amortisation charge has never exceed £41m in any season as the club has had a constant stream of players coming through the youth system. 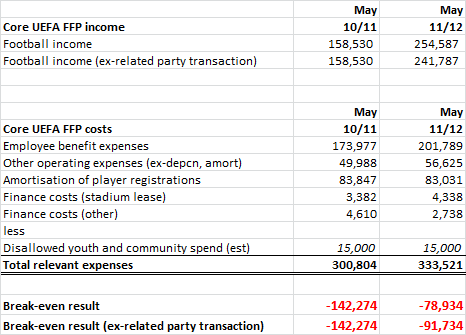 Although UEFA are not going to publish individual clubs' FFP figures it is quite easy to calculate a decent estimate. The items included in the calculation are set out in Annex 10 of the regulations. There are two main items which are not readily identifiable from most clubs' accounts; the total spending on dis-allowable items such as youth development and community programmes, and wages and salaries relating to contracts signed before the regulations were published in June 2010. Although not in City's accounts, the club have briefed journalists that there are £15m of dis-allowable expenses relating to youth development so I have used this figure. I have shown calculations both including and excluding the sale of intellectual property rights to ADUG for £12.8m. There is no detail on this transaction, but it looks like a one-off. The bottom line is that City reported an FFP loss of £79-92m last season. At first glance this looks like a pretty poor result vs. the target of £36.5m over two seasons, but some journalists are reporting that around £80m relates to player contracts signed before June 2010. This looks very high to me given the number of contract renewals that have taken place (the major players still on pre-June 2010 contracts are Tevez, Kolo Toure, Lescott and Barry), and I wonder whether journos have misunderstood and that the £80m is a projection over both last season and this one. In any event there will be a substantial amount that UEFA will ignore in making their calculations. The recent domestic PL rights auction transforms the outlook for clubs like City who are struggling to comply with FFP. The entry of BT into the market caused the value of domestic rights in the next three year cycle to rise by 70% (compared to a 3% rise in the previous three years period). BT's Ian Livingston is taking a huge gamble that he can break BSkyB's vice like grip on the UK sports pay TV market. He is betting £246m per annum that BT will succeed where Setenta, ITV Digital and (arguably) ESPN have failed. The exact impact on clubs' finances from the new three year cycle will depend on the eventual uplift achieved from international rights. Assuming a 50% uplift, the amount going to the league champions will rise from c. £60m to c. £100m (see Sporting Intelligence's excellent article for a full analysis). The uplift for a relegated club will be around £25m. Manchester City are very lucky that Ian Livingstone decided to barge into the market when he did. The £40-50m extra will alone more than halve the club's FFP deficit when the new cycle starts in 2013-14. Even before this new bonanza, however, the FFP gap will close somewhat. The club's share of the CL "market pool" will rise significantly this season because they are English Champions, adding c. £7-8m. City will also benefit modestly from the general 20% uplift in the amount clubs receive from the Champions League. The Nike kit deal signed in May 2012 will add another £9-10m per annum vs. the current Umbro deal. There will no doubt be further second tier sponsors announced in the coming months as well. As described above, the amortisation charge lags behind transfer spending, but with net cash transfer spending year to date down to £39m, the total charge should begin to fall from this year onwards (down by about £10m on my estimates). Taking these items together and assuming a top two finish, this season will see £30m+ improvement and by next season the gap will have closed by £70m+. Further trimming of the squad, especially high wage/non-playing players looks very likely. The club no doubt expects to begin to reap rewards from its youth development spending, whether through reduced transfer spending or increased player sales income. Also further out, there is potential for the developments around the stadium and the new Etihad campus to yield profits too. Finally, if City can start to work out the Champions League, there is a further £25m+ to be earned from getting into the late knock-out stages. City will no doubt miss the first break-even result test, despite the exclusion of pre-2010 contracts. Crucially however, there is decent visibility on a very substantial improvement in the club's FFP position over this season and even more next season as the PL TV bonanza rolls in. The club has been very, very lucky that TV income is continuing to rise so fast. There is no possibility that City would have been able to reconcile £200m of staff costs with the FFP rules without the enormous rise in TV money coming in the next 18 months. City still have much to do however. The "buy success" model needs to be replaced with a proper youth set-up that delivers high quality players. In the current first team squad, Micah Richards is the only player to have come through the ranks. Net transfer spending will have to fall and stay lower to keep the amortisation charge at a reasonable level. An £80m charge and a £200m wage bill are not compatible with a club generating £33m in matchday income (although the ticket price policy is to be applauded). Manchester City need to "bank" every penny of extra revenue they receive in the next two to three years.